Despite the potential of vaccines to boost public health and reduce healthcare costs, rates of administration—particularly in adults—fall well below target goals.1 The causes of low adult vaccination rates are multifactorial, given the complex interchange of communication and services in an increasingly complex healthcare system, as well as a host of patient factors. This article probes the many roadblocks to optimal vaccine coverage and how they can be overcome. 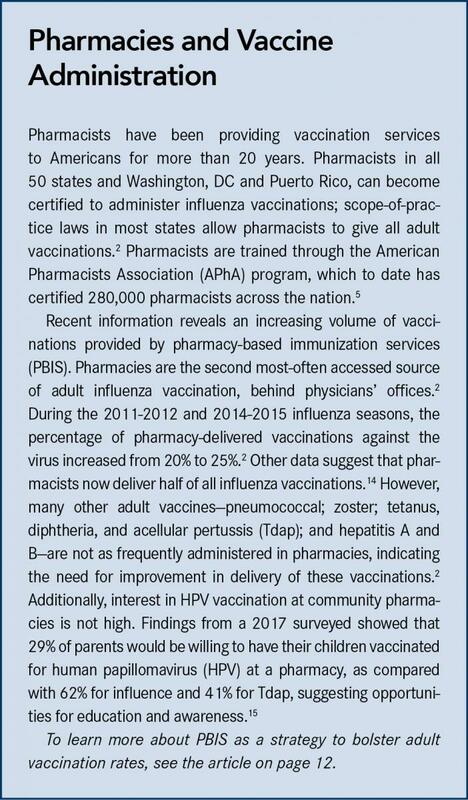 The American Pharmacists Association (APhA) and the National Alliance of State Pharmacy Associations conducted a survey of state immunization laws and rules to identify and highlight the variations. In 2015, 31 states required a protocol or prescription before pharmacists were eligible to provide vaccinations, and 21 states, depending on variables such as age and specific vaccine, allow for a protocol, a prescription, or vaccination without a prescriber.3 The survey broke down the results regarding patients’ age and vaccine types, showing that 27 states have no age limitation, and 46 states allow any vaccine type to be administered by pharmacists.3 The variations in limitations are with respect to age ranges from patients aged 5 years or older to those 18 years and older.3Another aspect that differs from state to state is student pharmacists’ ability to administer vaccinations.3 Current information is available via APhA’s Immunization Center webpage (pharmacist.com/immunization-center). There are 2 pieces to the cost of any given vaccination—the vaccine cost itself and the cost of physical administration. It is not unusual for the reimbursement for vaccinations to fall short of the vaccinator’s costs, making this a critical concern among pharmacists and yet another obstacle to their participation.4 As mentioned previously, reimbursement is another area in which a general lack of understanding about pharmacists’ ability to provide vaccinations appears to have a negative impact on pharmacy-based immunization services (PBIS). An APhA survey asked pharmacists what percentage of insurance plans they believed to be “nonreceptive” to covering pharmacist-provided vaccinations. Although only 9% to 17% of pharmacists surveyed reported that insurers are nonreceptive, pharmacists face other barriers to their inclusion as in-network or recognized providers by any given carrier.7 This is a barrier for any vaccination program that operates outside of a primary care provider’s office. In addition to the need for greater awareness about the benefits of vaccines, knowledge gaps remain when it comes to knowledge regarding benefits for vaccines. Despite general awareness about hospitals or physician offices that are “in network,” more awareness efforts are needed to educate patients about vaccine coverage under joint benefits or pharmacy-only benefits, which could potentially enable improved access in community settings.